Need Custom or Comprehensive Scrap Management Solutions? Scrapping Cars or Other Vehicles? Need Machine Shop and Metal Fabrication Services? 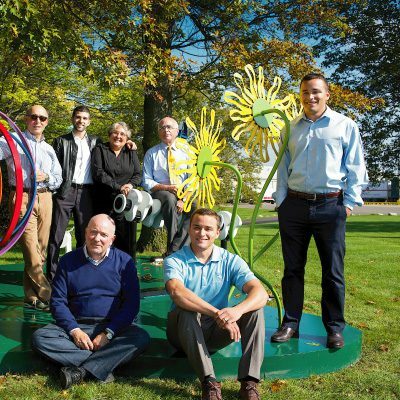 The Padnos family business has been transforming the recycling industry for more than a century. 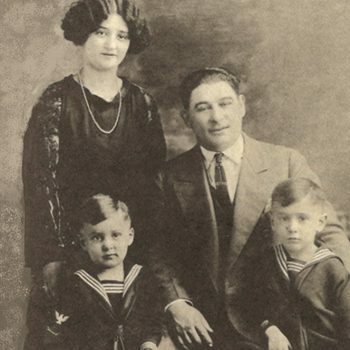 Louis Padnos emigrates from Russia as a teenager, crosses Europe and the Atlantic, peddles and trades through the U.S., and finally settles in 1905 in Holland, Michigan. 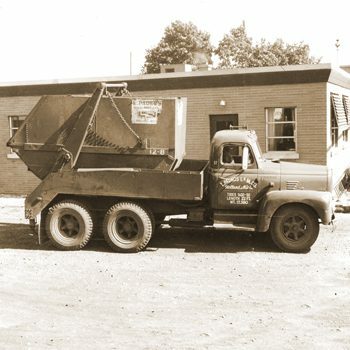 With horse and wagon, Louis peddles dry goods and trades for scrap throughout Western Michigan, the Upper Peninsula and Northern Wisconsin to begin fulfilling the American dream. 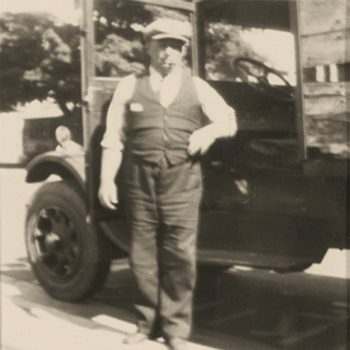 By 1910, Louis had been in West Michigan for five years and was well established in business. Out of his peddling had grown a small scrap yard on North River Avenue in Holland, Michigan dealing in rags, hides, metals, and furs. In 1920, Louis and his wife, Helen, welcome the arrival of their first son, Seymour, followed two years later by Stuart. Louis buys an existing scrap yard on East Eighth Street in Holland in which he and Helen are equal partners. When Louis falls ill, Helen single-handedly runs the business and the family’s affairs for nearly a year while still managing the home and raising their two children. The depression hits hard. 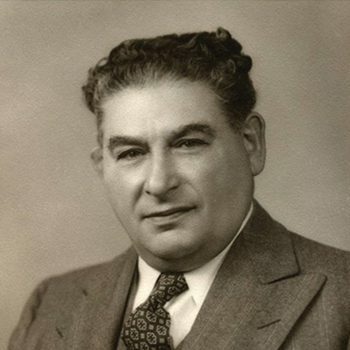 Despite the depressed economy in the early 30s, Louis makes a bold move to expand the business by purchasing real estate from the bankrupt Ottawa Furniture Company on River Avenue, a few blocks west of the PADNOS scrap yard. 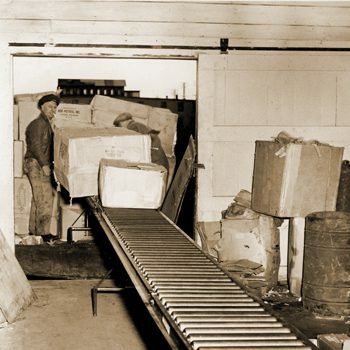 The steady success of the PADNOS scrap paper business persuades Louis to purchase a mechanical bailer in 1936, advancing the company’s entrée into scrap processing. 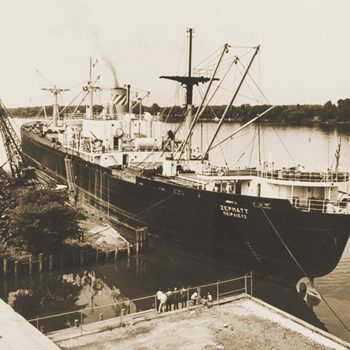 After the war, Seymour and Stuart take over running the family business from their parents… With the same determination that had characterized their father’s efforts in all the years since he had left Russia, the Padnos brothers set about expanding the family business. The Louis Padnos Iron & Metal Company incorporates in 1946. 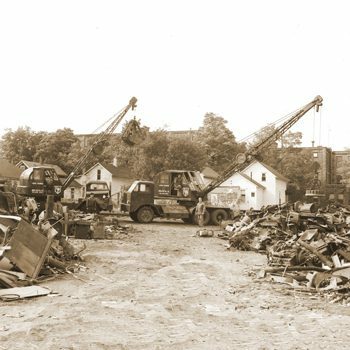 By the end of 1948, the company owns 15 vehicles, two mobile cranes, and employs a workforce of 30 employees. The company expands its operations west from the River Avenue plant and new equipment is purchased designed to make the yard more efficient. In 1955, the brothers inaugurate a profit-sharing plan, a plan that continues today. In 1959, Seymour and Stuart, with the concurrence of their families, establish the Louis and Helen Padnos Foundation as a way to give back to the community and honor their forebears. 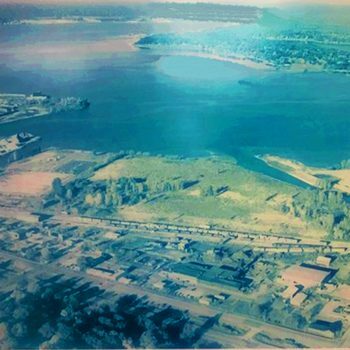 Beginning the 1960s, the company experiences tremendous growth into directions that had only been dreams – transforming the local processor into a company with international ties. 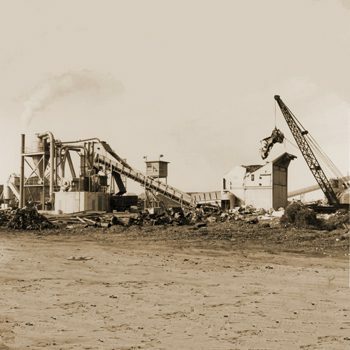 Seymour and Stuart become convinced that the scrap industry is in the midst of significant change and failure to keep pace will prove fatal – greater mechanization and increased efficiencies were critical. The company acquires the IXL Machine Shop, now a division of PADNOS responsible for keeping all the PADNOS equipment operational. To further the breadth of the company’s processing capabilities, the company installs one of the few hot briquetter systems in the industry to heat and form turnings and borings into pillow-shaped briquettes. In 1974, the company receives $27,333 refund on its workers’ compensation insurance thanks to employee efforts in maintaining an outstanding safety record. Seymour and Stuart decide that since the employees had actually ‘earned’ this money, it would go to them in the form of college tuition grants for their children. This action marks the start of the PADNOS Dependent Scholarship Program, a scholarship for employees’ dependent children to attend college. 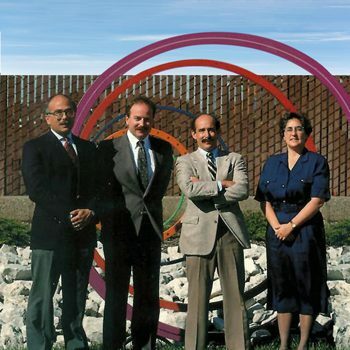 In the late 70s and early 80s, the third-generation PADNOS family members join the company – Jeff, Doug, Mitch, and Shelley. During the economic downturn of the early 80s, the company prepares for additional growth. Others in the scrap trade are not as well positioned and are unable to cope with the economic challenges, providing the company with acquisition opportunities. With the same tenacity and true grit of the second generation, the third generation decides to expand the company’s geographic footprint and heads to ‘the big city’ of Grand Rapids, acquiring two of the main competitors in the area. 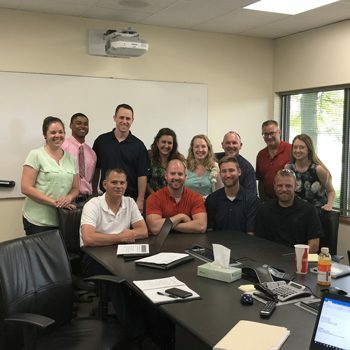 The 90s marks continued geographic expansion with two major acquisitions – one provides a footprint in Lansing, MI and the second presents locations in Muskegon and Traverse City, MI. In recognition of their many efforts on behalf of Grand Valley State University, GVSU confers a number of honors on Seymour and Esther, including the dedication of the Seymour and Esther Padnos School of Engineering. 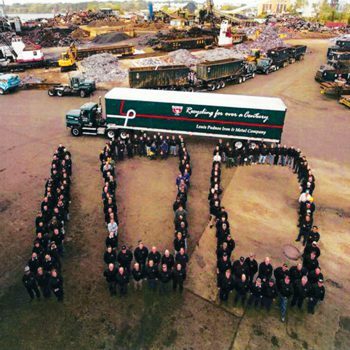 In 2005, the company celebrates its 100th anniversary. In 2008, the company expands its plastics recycling business and purchases a 450,000-square foot building at 500 44th street in Wyoming, MI. The company makes additional acquisitions of scrap businesses in southern Michigan – Dowagiac, Benton Harbor, and Buchanan and advances the company’s central Michigan footprint in Alma. The fourth-generation family members, Jonathan, Sam, and Josh join the family business. Consistent with the company’s commitment to the environment, PADNOS installs the largest (at that time) solar panel installation in the State of Michigan at the company’s Wyoming, MI facility. The company continues to broaden its processing capabilities with the purchase and installation of its wire chopping plant. As part of its commitment to staying current with cutting-edge technology, the company makes its largest capital investment in history, installing an advanced metal sorting unit that is capable of separating nonferrous metals from dry recyclables, a significant advancement in the company’s processing strength. In 2014, PADNOS invests in its first out-of-state expansion with the purchase of a plastics compounding business in Fremont, IN, now known as PADNOS Plastics Solutions. We’ve come a long way from Louis Padnos’ early 1900’s single, horse-drawn wagon. Today, PADNOS is over 600 team members strong and continues our deep commitment to the values of the family business Louis built. Our culture is one in which continuous learning is an integral part of every role. Every single team member has a written personal and professional development plan with access to learning through PADNOS Academy. Growth. Opportunity. Success. Energy. And a passion for scrap… that’s how we started and that’s how we will grow. Looking for Machine Shop and Metal Fabrication Services?